San Marino is a country characterized by its architecture--namely, the three towers that adorn the country's flag and coat of arms. As a result, most of the tourist attractions here center around the structures protruding from the hill of the country. 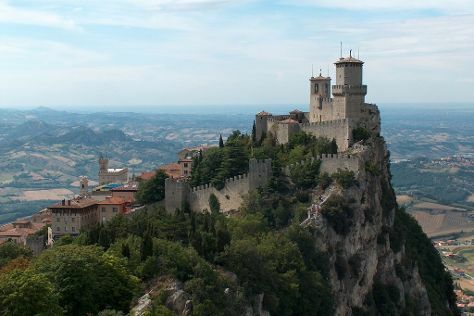 The third-smallest nation in Europe, it is surprising that San Marino managed to gain independence from robust Italy. This status has created great pride among the Sanmarinese, although Italian culture is still quite influential as the country is completely surrounded by Italy. And while its size has obvious disadvantages, the advantages for tourism strongly outweigh them. Visitors don't need to travel to get a sense of the country (there isn't far to go! ), and this generates an intimacy and friendliness among locals that is lost in most larger countries. San Marino is in Europe. When using our San Marino trip planner to make an itinerary online, San Marino holidays come together around your tastes, interests, and requirements, with us taking care of the logistics.